A good number of contemporary cocktail books are little more than curated compendiums of classic cocktail recipes. Since you can’t really copyright a classic cocktail, it’s easy to pull from various recipe sources to make a nearly instant cocktail book (or have a ghost writer do it for you). How many copies of martini and margarita recipes does one person really need? To cover most of your basic cocktail bases, all one has to do is pick up the Savoy Cocktail Book, Dale DeGroff’s Craft of the Cocktail, and David Wondrich’s Esquire Drinks, and in three books you’ve pretty much got the basic cannon covered. Amongst the sea of curated cocktail books is an important new voice, and at this point it’s a “whisper”: Warren Bobrow, the Cocktail Whisperer. While Warren may not have the star chef or star bar resume (he actually did a 20 year duty in finance before coming to cocktails), Warren understands cocktails and has generated an unprecedented number of completely original cocktails. Most of these drinks aren’t just riffs on the classics, but wholly original libations based on the same kind of flavor combination thinking that you’d find in a great chef (which, unbeknownst to most, Warren is). 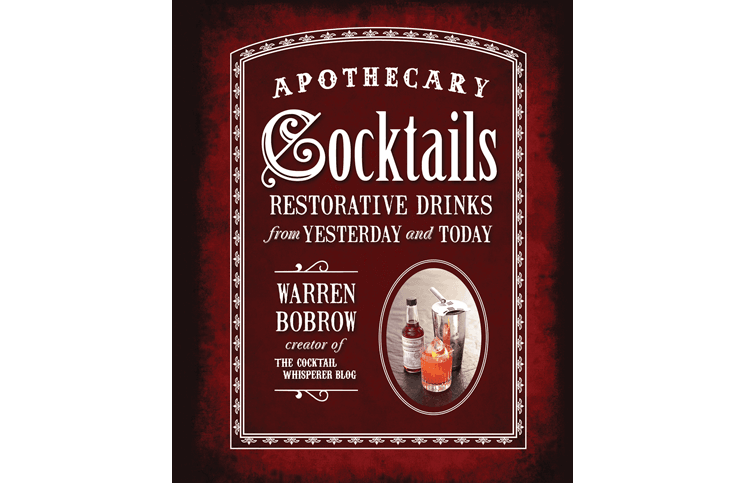 In his first book, Apothecary Cocktails: Restorative Drinks from Yesterday and Today, Warren Bobrow turns his focus to the original use of spirits and cocktails: as tonics and medicine to help cure a wide array of ailments and malaise. The book is divided into seven different sections, including Digestives and Other Curatives, Winter Warmers, Hot-Weather Refreshers, Restoratives, Relaxants and Toddies, Painkilling Libations, and Mood Enhancers. Warren really covers the complete spectrum of medicinal cocktails with a drink for almost every ailment that alcohol traditionally addressed. Apothecary Cocktails: Restorative Drinks from Yesterday and Today is a beautifully constructed book. It’s a hardcover book but inside it’s spiral bound, which makes it easy to lie flat as a reference as you make a drink. The photography is top notch with drinks that simply jump off the page. The real star of the book, of course, is Warren’s cocktails. Warren brings together some essential historical tonics (some of them familiar) with clear context on how the drink evolved and exactly what it was used to treat. One of the great things about Apothecary Cocktails is the range of complexity in preparation that Warren offers. Some drinks, like the Coconut Cooler or Doctor Livesey’s Cocktail, require just a few basic ingredients, while others, like the Nix Besser Cocktail or the Rhubarb Fizz with Charred Strawberries, require advanced kitchen preparation. All of the recipes in Apothecary Cocktails are listed both in imperial and metric measurements, and very few of the recipes call for specific brands. Instead of saying something like Barr Hill Gin or Rhum JM, the recipes simply state “botanical gin” or “rhum agricole”. Each cocktail recipe in the book has clear and easy to follow instructions. Perhaps the most important aspect of Warren Bobrow’s book is that the cocktails are superb. Daring drinks like the Thai Basil Fizz, which brings together basil, gin, absinthe, Peychaud’s bitters, and ginger beer, sound intense, but the flavors combine into something slightly magical. Cocktails like The Harley Dodge, with peach, whiskey, vermouth, and bitters, feel like classics but are quite original. Some of our favorites come out of Warren’s Pain Killing section, including The Old Oak Tree Cocktail and Cocktail Whisperer’s Painkilling System #200, both smart flavor combinations and beautiful drinks. The book also has some fun oddballs like Roasted Beet Borscht with Sour Cream and Vodka, and a “Corrected” Scotch Broth, both nods to Warren’s time as a chef. Apothecary Cocktails: Restorative Drinks from Yesterday and Today is a real treasure trove with cocktails that span a wide range of flavors, styles, and complexity. Not only is it a cocktail book that you should add to your collection, it’s the debut of an important new voice in the cocktail world and the start of a very promising career. You can buy Apothecary Cocktails: Restorative Drinks from Yesterday and Today at Amazon. Hardback copies sells for around $17, and the Kindle Edition around $10.